It's bright and cheerful in the kitchen. 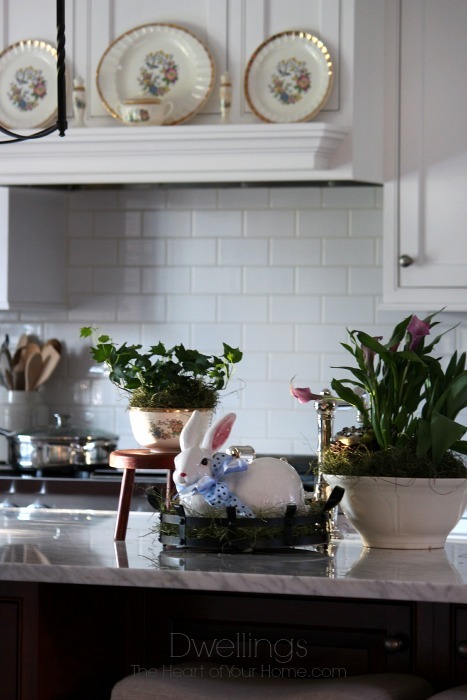 Since adding spring touches to the mantel in the keeping room, more have been added in the kitchen. 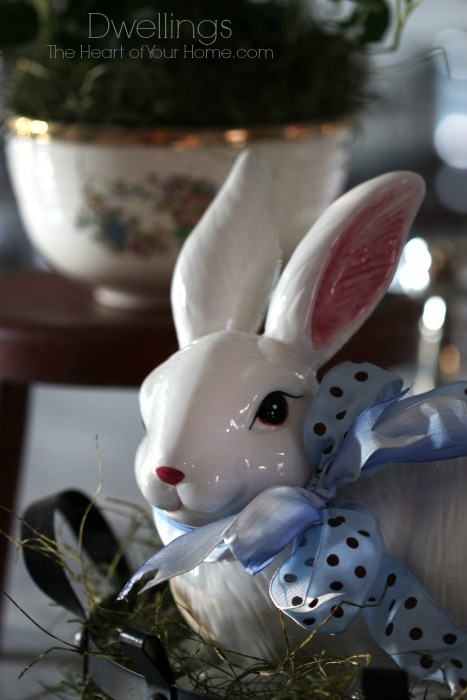 On the island I've used gifts from friends, the bunny a gift from one and the tray a gift from another. The bunny sits on a fresh bed of green moss. Granny's dishes have a sweet pattern with flowers, birds, and a birdhouse, so I placed a few on the vent hood mantel for a touch of spring. 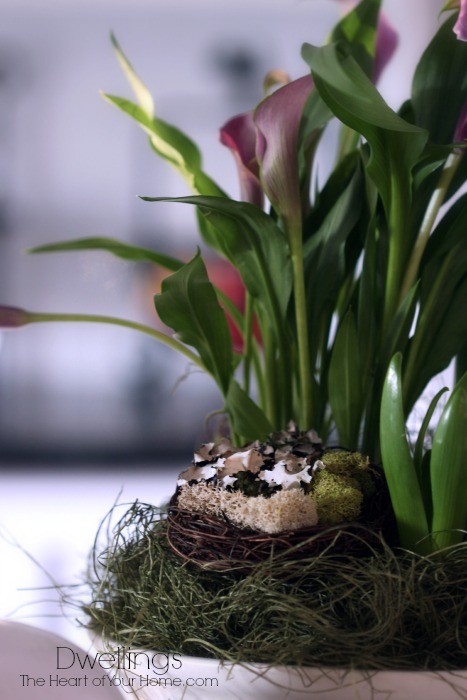 On the island, a small fern was added to one of of Granny's bowls and then placed on a small stool for a little height. I filled the ironstone bowl with three plants; a lily, hyacinth, and tulip. 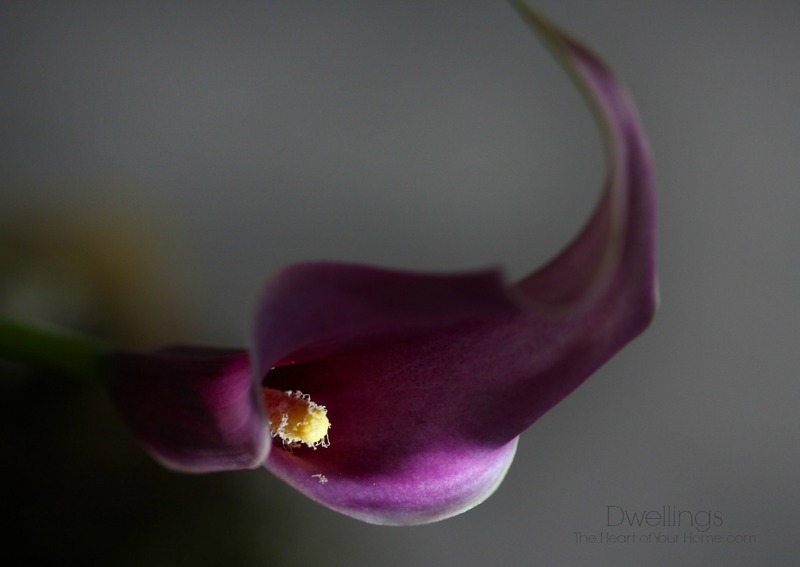 The lilies are in full bloom, vibrant shades of purple. It will be another day or so before the tulips and hyacinth blooms open, hopefully by Good Friday! There's a birds nest too. I love the shadows in the kitchen as the sun goes down. There are more spring touches to share! You can see the mantel here, Keeping Room Spring Mantel. Thank you for your wonderful decorating site - great images! What a beautiful and perfect Easter/spring bit there, Cindy! Looks GREAT! So lovely Cindy, love that your decorated your vignette with real plants! Hi Cindy! Oh, this little vignette is just so sweet. 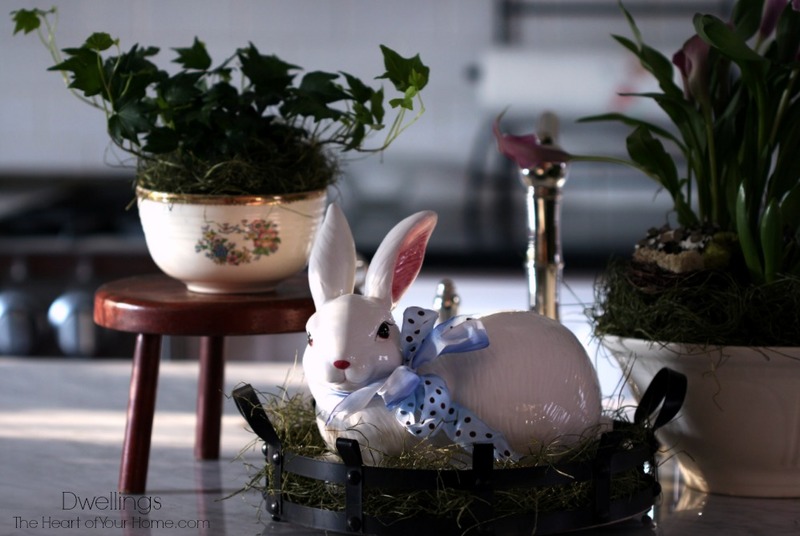 What a cute little bunny and I love that little stool! Happy Easter, sweet friend. 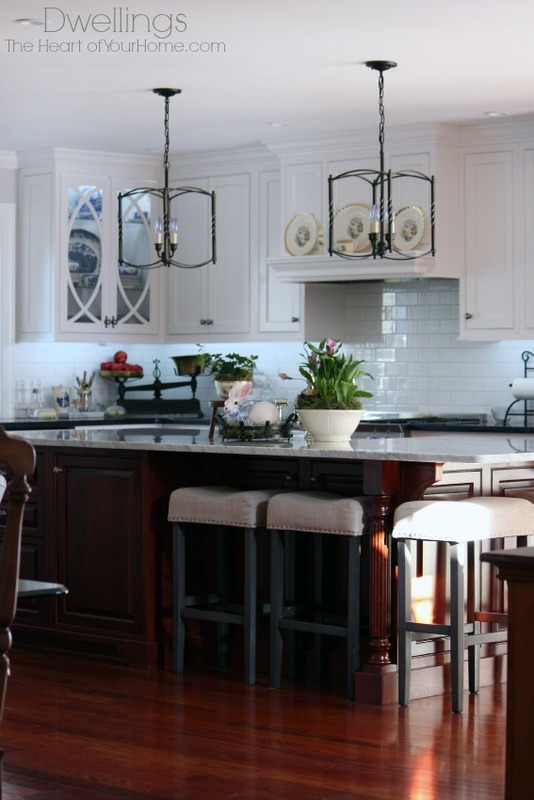 The island in your kitchen is a beautiful starting point for decorating. It all looks so lovely - I line the plates on the hood. 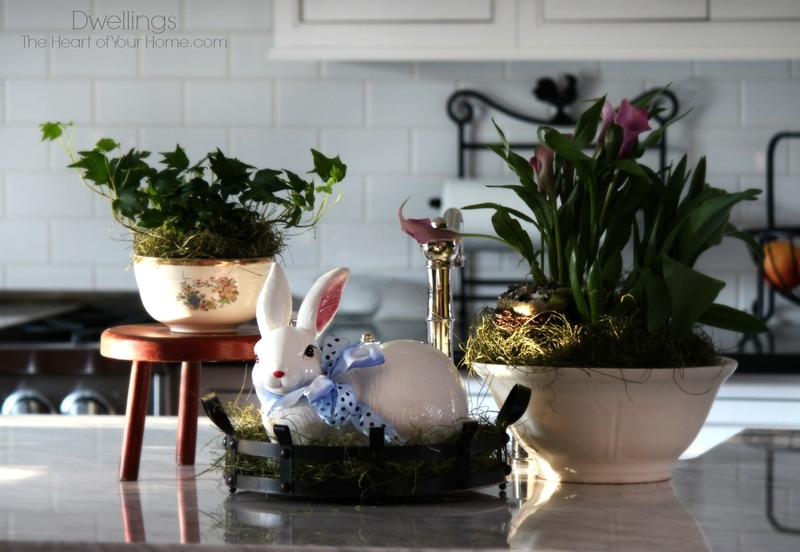 Love all the spring touches, so warm and inviting! Very pretty Cindy, I'm loving that sweet looking white rabbit! Very sweet! 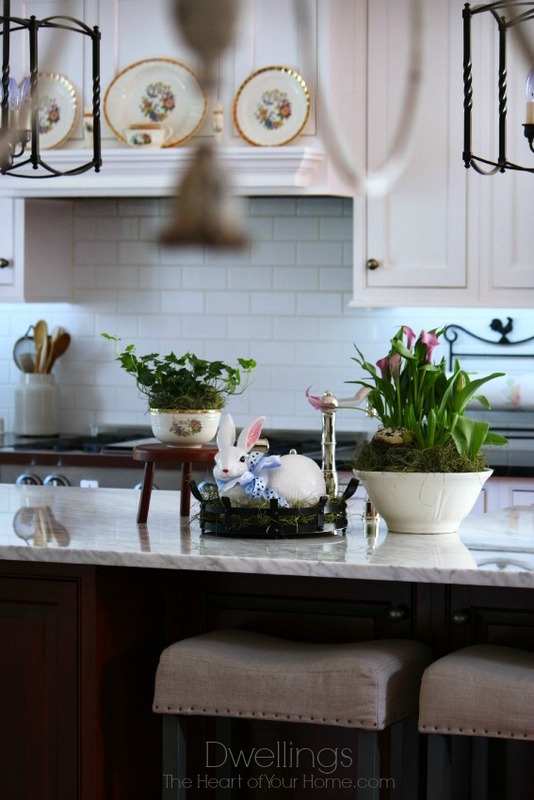 I am envious of your kitchen island--wish there was room in my kitchen for one! Your kitchen is very cozy and inviting.